Thanksgiving cooking, simplifiedCooking Thanksgiving dinner is a bit of a project-but a rewarding one-and with this inspiring collection of recipes from Mark Bittman, author of the award-winning How to Cook Everything series, anyone can be confident preparing the big meal. Here is a quick reference that's sure to be your kitchen companion for many holidays to come. 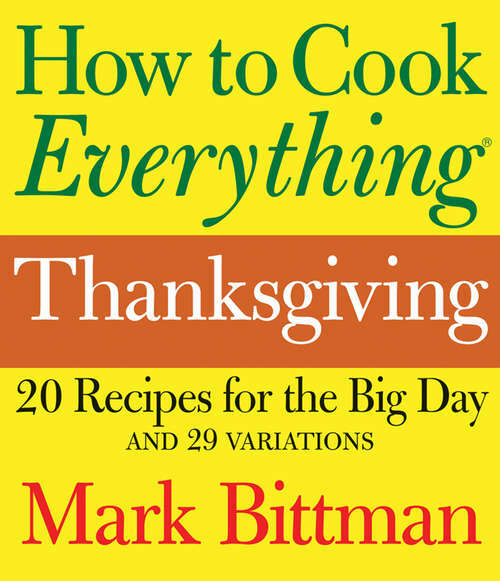 How to Cook Everything Thanksgiving includes 20 of Bittman's favorite celebration recipes-plus 29 variations and helpful how-to illustrations-to ensure you feast well without all the hassle. Complete with both beloved classics and non-traditional ideas, from easy appetizer dips and autumnal sides to the iconic turkey, vegetarian mains, and delicious, make-ahead desserts, this is one guest that's always invited to Thanksgiving dinner.